For low-tech irrigation with simple pumps or manual you can use our own irrigation buffer. Used as wicking bed tank for substrate based barrels. Attached to the top lid one inverted sprinkler is used for irrigation inside the barrel corpus. There are quite a few options to ensure irrigation of the barrels for soilless or substrate based use, multiple barrel or standalone operations. The ideal flow rate is 1-5 liters per minute. Once the liquid attaches to the inside surface gravity will do the rest for you. You can find larger examples on our system integration page. a) How should the nutrient solution enter a vertical barrel? If the line delivering the liquid is a no-pressure line, you will need to use our water buffer part. 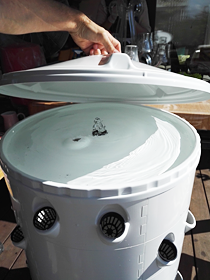 You can feed it either from the covering top lid from above or using an additional fitting from inside the barrel. 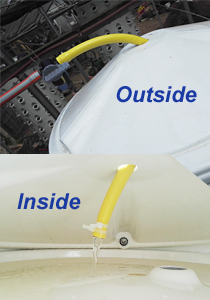 If you have a pressure line (>1.5 bars) to feed the liquid coming from the outside of the vertical barrel you do not need the additional water buffer piece. Instead you can mount our sprinkler on top of the lid and connect your line from there. The sprinkler has a valve to shut down the barrel or fine tune the amount of liquid. 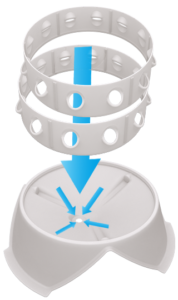 The inverted sprinkler distributes the liquid evenly on the inside surface. b) From where are you planning to cycle the liquid once it reaches the base of a vertical barrel? When you are running multiple vertical barrels it makes sense to drain all the liquid from all your barrels and direct it to a central reservoir. In this case no liquid will remain in any vertical barrel. Use the multi barrel base to do that. When you plan to run just one or a few vertical barrels, using an external reservoir is not necessary. You can use the closed base instead. 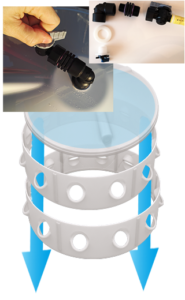 In that case all the liquid remains in the base and can be recirculated from there for example using a simple submergible pump. Using an inverted sprinkler operating at a pressure of >=1.5bar liquid is sprayed evenly in 360 degrees to the inside walls of the barrel. 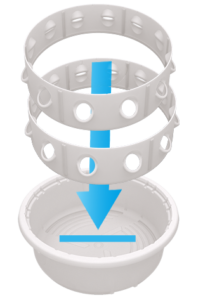 The two net pot insert 1/6 part has an inner wing structure to then distribute the liquid flowing down the inside to each root zone of your plants. The flow rate of this standard irrigation method is 2 liters per minute. Please note: It requires fine-tuning at the valve to 2l to max 5l/min! If you run much too much water through the sprinkler, you will probably end up with unhappy wet plants and water pushing out from your barrel! Using a spray nozzle operating from a pressure of +3bar. 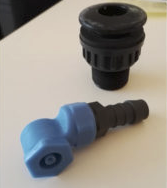 These spray nozzles are self cleaning for smaller particles and spray a hollow cone shape of 120 degrees from the top lid – basically the same shape as the top lid itself, filling your barrel up with a drizzle of fine droplets. The flow rate of this more aeroponic irrigation method is 1.5 liters per minute. 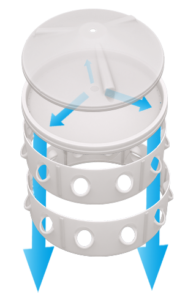 Another irrigation option for multiple barrels with low-tech pump (low pressure) can be an combination of the irrigation buffer from above plus a modified sprinkler on an top lid. 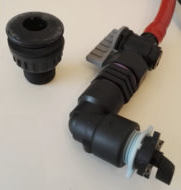 .. OR b) without the center hole from the outside through the top lid into the water buffer if you are using multiple vertical barrels but do not want to use the sprinkler requiring a pressured line. Since the concept of the barrel is just to provide a flexible corpus to grow plants at high density, you could well integrate your own irrigation idea! Lids and stands can be drilled for the integration of the above options. But you can also integrate your own – like fogging or anything else that might suit your crop. 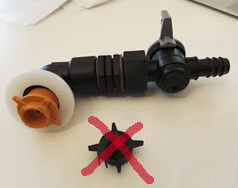 Aponix.eu can also send you the parts without any pre-drilled holes for testing purposes.